On the 50th anniversary of the first manned space flight, we celebrate Soviet and Russian contributions to understanding the cosmos. A successful test of the world’s first ballistic missile, the R-7, was carried out in August 1957, 11 years after May 1946, when Joseph Stalin signed a decree to establish a rocket-building industry. Sergei Korolev, appointed to head the program, was given broad powers. German developments, that the Soviet Union had obtained after World War II, especially for the V-2 rocket, were helpful. A launching pad was created near the village of Tyura-Tam in Kazakhstan, which later became known as Baikonur. In fall 1957, the intercontinental ballistic missile put the first artificial Earth satellite into orbit. The Soviet Union launched the first artificial Earth satellite "Sputnik-1" on Oct. 4, 1957, thus ushering in the space era. In Russia, that day is marked as Space Forces Day. News of the launch stunned the world because Western propaganda had been pushing the idea that the Soviet Union was technologically far behind the West. U.S. President John F. Kennedy admitted: “When we learned that the Russians had launched an artificial Earth satellite, we were in a state of shock and could not make decisions or talk to one another for a whole week.” The satellite emitted radio waves, and its signal could be heard by any amateur radio fan. Radio magazine published detailed instructions on how to receive signals from space. The two cosmonaut dogs’ real names were Albina and Markiza but the country’s leadership did not like foreign-sounding names. The animals were given new names and, in August 1960, became the first living creatures to orbit the Earth. Their space voyage lasted a little over 24 hours, during which the spaceship circled the Earth 15 times. The dogs were used to study the impact of space flight (overload, weightlessness and radiation) on a living organism. Both dogs lived to a ripe old age and died natural deaths. Their stuffed bodies are now at the Cosmonautics Memorial Museum in Moscow. When the Americans became the first to land on the Moon, Soviet pennants had been there for 10 years already. They had been dropped on the Moon’s surface on Sept. 14, 1959 by the Soviet space station Luna-2, which was the first probe to reach the moon. That same year, the Soviet Luna-3 station photographed the dark side of the moon. On Apr. 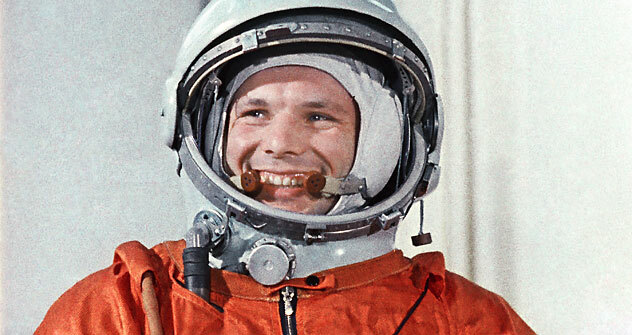 12, 1961, Soviet cosmonaut Yuri Gagarin became the first human being to fly to outer space. You can read more about that memorable event here. The first real full-pressure spacesuits were made in the Soviet Union in late 1959. Scientists were already testing them when the assignment was modified to a simple protective suit: The spacesuit was to protect the cosmonaut only after the landing module was safely back on Earth. Chief Space Designer Sergei Korolev put his foot down and eventually the full-pressure suit SK-1 was created. The world’s first moon rover, Lunokhod-1, was also created in the Soviet Union. It was intended for studying the moon’s surface, radioactive and space X-ray radiation on the moon and the chemical composition and properties of moon rocks. It was delivered to the moon’s surface on Nov. 17, 1970 and worked for 10 months, three times longer than its designed lifespan. Lunokhod-1 covered a total distance of 10.5 kilometers, transmitted 211 panoramic lunar pictures and 25,000 photographs. Soviet scientists were also the first to land a workable space apparatus on another planet — Venera (Venus). Venera-7, an automatic space research station, landed on the surface of Earth’s neighboring planet in mid-December 1970. The body of the landing module was made of titanium to withstand the pressure of 100 atmospheres and 500-degree heat. Previous probes had not been designed for such stress and were crushed at an altitude of about 25 kilometers. In March 1965, Soviet cosmonaut Alexei Leonov became the first to take a walk in space. He spent 10 minutes in free flight at a distance of more than 5 meters from the spaceship. He covered a large distance on the spaceship’s trajectory (which was hurtling through space at a speed of more than 7 km per second). As the spacesuit was designed to last half an hour in open space, Leonov had to bleed off the exceeding air in order to be able to squeeze through the hatch. Valentina Tereshkova (sign call Chaika, or Seagull) was the first woman cosmonaut. She spent nearly three days in space aboard the Vostok-6 spacecraft. Tereshkova later married cosmonaut Andrian Nikolayev. Their daughter Yelena became the first child born to a “space” family. The Mir station was the first consistently inhabited long-term research station in outer space. The main module was put into orbit on Feb. 20, 1986. Over the next 10 years, six modules were successively added to it. The Mir station covered a distance slightly longer than that from Earth to Uranus (2.871x109 km). In 2001, the station was scuttled in the Pacific. The first commercial astronaut, the Japanese journalist Akiyama Toyohiro, went into outer space aboard the Soyuz TM-11 spacecraft in early December 1990, although the space tourism era is considered to have started with the flight by American businessman Dennis Tito to the International Space Station. Soyuz spaceships have delivered several more tourists to the ISS Russian section. Space tourist flights have solved at least two problems: they have maintained media interest in space matters and brought private capital into space programs.